Displayed on the wall of the store where I work are majestic African tribal robes, Indonesian necklaces as big as breastplates, elaborate Japanese altars, and heavy strings of shells from Papua New Guinea. I love the necklaces, especially, and the other day I finally tried one on. It was grand and angular and cold on my skin, and I felt queenly. Then I saw myself in a mirror. I looked like a mouse in a crown. As much as I loved it, it overwhelmed me. This is how I’ve felt about Tauer Perfumes L’Air du Désert Marocain. I adore the fragrance’s heady, helicopter-over-the-Grand-Canyon feel, but ultimately it's too hard for pallid me to pull off, and I swapped away my bottle. This year, Tauer released Au Coeur du Désert, an Extrait interpretation of L’Air du Désert Marocain. I may have found my tribal robe at last. 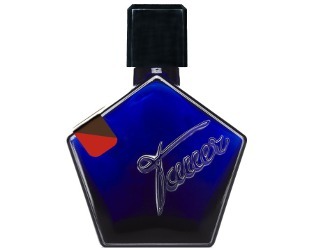 Tauer Perfumes L’Air du Désert Marocain launched in 2005 (has it been eleven years already? ), and its notes include coriander, cumin, petitgrain, lemon, bergamot, jasmine, cistus, geranium, cedar, vetiver, vanilla, patchouli and ambergris. L’Air is an Eau de Toilette, but only in the way that Mahler writes “songs.” This is one mighty Eau de Toilette. L’Air du Désert Marocain is a rush of cedar and amber so shimmery and velvety that it feels like being trapped in a tiger’s eye jewel. The rest of the fragrance softens the edges a bit: coriander and cumin add interest and keep the amber from being too sweet; jasmine and vetiver perform the same function as the water in a bourbon on the rocks; and patchouli and cistus give it legs. The combination is dense and angular, and it wears on me the same way a tuberose can be so narcotically spectacular for half an hour, then I need a rest. Maybe I’m a fragrance introvert. Au Coeur du Désert is like L’Air du Désert Marocain prepared by a different chef. The ingredients are the same, but Au Coeur du Désert feels smoother, richer, and more elegant. The cedar's edges have been sanded down, and the fragrance’s ambery heart smells less sweet and more subdued. I wonder if Tauer upped the jasmine and maybe added a hint of rose to this one, too. It is rich, rich, rich. Both L’Air du Désert Marocain and Au Coeur du Désert are maximum-presence fragrances, and one light spray will give you a good taste. Au Coeur du Désert lasts nearly twice as long as L’Air du Désert Marocain — a few dabs from my sample vial sees me from breakfast to sundown, no problem. Are you a fragrance introvert? How do you fare with “majestic” perfumes? Tauer Perfumes L’Air du Désert Marocain Eau de Toilette is $130 for 50 ml, and Au Coeur du Désert Extrait is $185 for 50 ml. For information on where to buy them, see Tauer Perfumes under Perfume Houses. 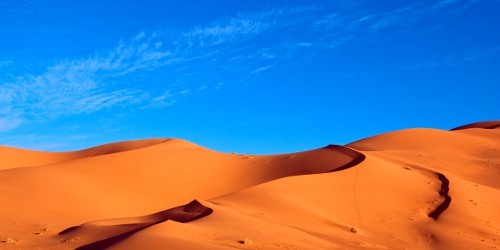 Note: top image is Erg Chebbi Dunes [cropped] by Scott Presly at flickr; some rights reserved. Well as the person who was a sillage monster in the 1970s and 1980s wafting of Poison, Gorgio, Obsession, etc. I never considered myself to be a fragrance introvert but the list of notes on LDDM scares me…cumin (nope can’t do that) ambergris (not that either!) so maybe I am an introvert afterall? The cumin doesn’t stand out at all, if that helps–but if you look for it, it’s there, true. But, amber! You might be surprised at where it lurks…. I didn’t even know it was in there – can’t detect it. I am quite the introvert in real life, so I’m not quite sure why I’m Auntie Mame when it comes to perfume, but BWFs, sillage monsters, majestic ambers – bring it on! “Au Coeur du Désert lasts nearly twice as long as L’Air du Désert Marocain” Holy Cats! LADDM has lasted all day, all night and through the next morning’s shower on me. I can’t imagine something lasting longer than that, but I’m sure I’ll be trying it for myself soon. It sounds glorious! It’s a regular plutonium for half-life! If you like L’Air, it’s worth a try. I love it how your fragrance self is a partier, while you’re more quiet. Personally, I am glad you had to swap the original L’air and hope you got something nice in return. (Sorry, I don’t remember.) So, yes… I’m a fragrance extrovert, I guess. At least as far as angular scents go. Oh, were you the one I swapped with? Good! I’m glad someone worthy got it, and I’m sure I ended up with something fabulous in return. I keep trying for those extroverted perfumes, but feel similarly about them. Though in discreet doses, they do satisfy. I have a Tauer issued sample of LADDM and it has lasted me a loooong time because of tiny dosing. I did get a decant of Au Coeur and prefer it. I actually find it a bit sweeter, damper,and more ambery and LDDM more dry, dusty woods and spices. I haven’t dared to actually use the sprayer with AC yet either. It sounds like you’ve taken the cautious approach I would, too! LADDM is a wonderful wonderful scent but I always knew it was something I could never wear. I doubt Au Coeur would work for me either except I’m interested to hear from Elisa that it may not be as dry. The dustiness of the original was fascinating, and yet I tend not to do well with very dry perfumes. Like Aparatchick, I’m an introvert who enjoys extrovert fragrances. It’s not an uncommon thing. I’m wearing Songes today, but with neutral tones, letting the perfume make the statement. I’ve often wondered whether extroverts like quiet, subdued fragrances? Oh, that’s a great question about whether extroverts like quiet fragrances! Maybe someone will chime in. I do love Songes, too, and Shalimar and Narcisse Noir and a few other big scents, so maybe I’m less of a fragrance introvert than I’d thought. I like extrovert and introvert fragrances. I confess, my favorite Tauer, besides Lonestar Memories, is Le Maroc pour Elle. I have a full bottle of Phi but sometimes the powerful tobacco is a bit wearing. I enjoy Rose Flash and Incense Flash. I found LADDM not as enjoyable as the aforementioned and this was surprising because I love dry fragrances. Une Rose Chyprée is one of my favorites Tauers, but I think Au Coeur is up there, too. I remember like Le Maroc pour Elle a lot, but it’s been too long since I’ve smelled it! I’m an extrovert in real life but a perfume introvert by necessity to keep peace with family and to not step over the line while commuting and at work. I am a walking cumin detector and hater that I have yet to try LADDM on skin (I have an Explorer Set travel spray) and my recently arrived decant of Au Coeur du Desert. Oh, now I’d really love to know how you like it, and if the cumin is too insistent for you! I used to love L’Air du Désert Marocain, but recently I find the patchouli takes over and is a bit too much for me. How would you compare Au Coeur du Désert in that regard? Also, I wanted to like Phi, but it has one of those strong woody ambers. Any of that stuff in Au Coeur du Désert? Of course I need to just be less lazy and try it for myself. BTW, nowadays, I get my incense fix from MCG Sideris. It reminds me of L’Air du Désert Marocain but is softer. I do miss how L’Air du Désert Marocain used to smell to me, though. It’s a bit spicier, I think. I don’t find the patchouli in Au Coeur overwhelming, but it didn’t bother me in L’Air, either, so take that into consideration. As for woody amber, I’d say Au Coeur might feel a touch woodier and less sweetly ambery than L’Air. I’d love to know what you think of it, though, if you try it. You might love them! L’air is legendary, and Au Coeur is sure to follow. I like LddM but have no desire to own it which is how I feel about most Tauers, Une Rose Chypree being the exception. Au Coeur du Desert sounds nice though, I appreciate your description of being caught in a tiger’s eye jewel. I tend to be an introvert unless I know someone well, then I’m extroverted, but in any case I love majestic perfumes. Along with chocolatemarzipan8, I was a sillage monster back in the day, maybe that makes a difference? Oh, “majestic” is now my new favorite way to say “big and grand”! Thanks. My skin disappears perfumes so I tend to prefer stronger ones. On the other hand – I do start to find powerful perfumes a bit tiring after a couple of hours. I guess it all depends on the actual scent! I find L’Air more grand than desolate, but I understand exactly what you mean. You’re making me crave a bit of joy on my wrist right now! I love LADDM as well as Coeur du Desert. But then I love strong oriental scents in general, and most Tauers in particular. Then this one was made for you! “Maybe I’m a fragrance introvert.” I love this. I am definitely a fragrance introvert. Anything that is too scratchy or lasts too long gets under my skin and really rubs me the wrong way! I do own some stronger ones, but they get sprayed far away from my nose (yes, YOU Mitzah). I adore some big hitters (SSS Tabac Aurea for instance) but only wear when I’m feeling extra extra outgoing. Thanks for the wonderful review comparison, Angela! I’ve been away for a while, but it’s so nice to pop in again to our wonderful community here at NST. Thanks everyone for making this what it is! It’s interesting to me how we can be introverts in some areas and extroverts in other. For me, a lot of it is about how well the fragrance balances with my personality. When I feel like the perfume’s character overwhelms my own, I need to put it aside (or keep a small decant to admire).